Today we will be pitching two hardware heavyweights against one another in the first head to head between two motherboards based on Intel's new 'Eaglelake' P45 chipset. Being the direct replacement/refresh for its highly praised and successful predecessor, the 'Bearlake' P35 chipset, the P45 is pitched to be the logical evolution for enthusiasts, providing an increase in FSB support to a now official 1600mhz. PCIe 2.0 is now supported too, along with the incorporation of an updated Southbridge to the ICH10/10R. ATI's CrossfireX is now also supported, albeit in an 8+8 configuration, reserving the higher bandwidth 16+16 for the X38/48-based motherboards. While 8+8 lanes have been seen before on certain variants of P35 (Asus Blitz), this was done by the use of a separate Crosslinx bridging chip and these boards were as rare as hen's teeth. Most P35 based boards were in a 16+4 configuration with the 2nd PCIe slot gererally crippling a dual card setup. 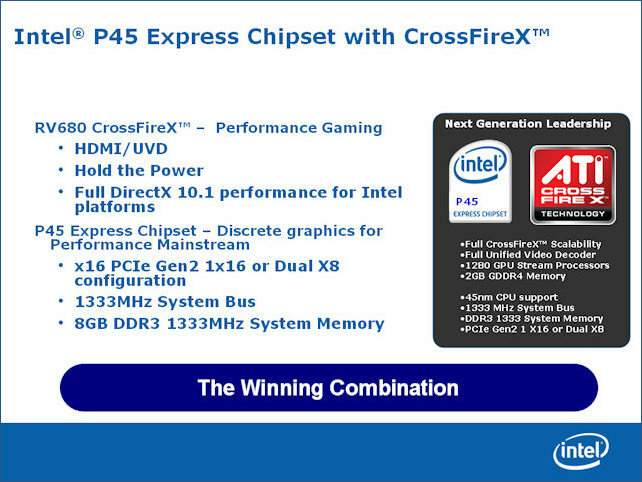 With the P45, CrossfireX is supported natively and will be widely available upon release rather than just limited editions. This could give ATI a leg-up in helping them crack Nvidia's current stranglehold on the GPU market. If I was a cynic I might think that Intel may also be paving the way for their own 'Larabee' GPU's...but that's another story. So in the red corner, representing the tried and tested DDR2 format, we have the Asus P5Q Deluxe. With a thoroughbred pedigree and being widely regarded as one of the best manufacturers of P35 & X38 based boards, it is of no surprise that Asus are seen as the dominant force in motherboard production. In the blue corner we have the MSI P45 Diamond, which has taken advantage of DDR3 support. While this is a bold move considering the much cheaper DDR2 prices at the time of writing this review, it makes sense in that a high end board should make use of the latest technology. As MicroStar International is hardly a lightweight when it comes to hardware, this should make an interesting battle of silicon and copper, and with both manufacturers taking a different approach to cooling methods, this will hopefully make for an interesting read. During this review I intend to perform a direct comparison of both boards rather than review each board separately. I will, however, be going into detail showing each motherboards own attributes and possible downfalls. While the Asus P5Q Deluxe is not from the pinnacle of Asus' P45 releases, not being labelled as a ROG (Republic of Gamers) board, it is pitched as a high end board aimed squarely at the overclocking enthusiast. The MSI on the other hand is at the top of the pile, being labelled as a Diamond Gamers board, hoping to lure you in with its premium features. So please, make yourself a brew and sit back while I put these two boards through their paces and see who can go the distance and be crowned the winner in this OC3D exclusive knock-out match.